Make some fun and easy St Patrick’s Day crafts for kids to celebrate the holiday where everyone is Irish for the day! St. Patrick’s Day is a fun holiday when everyone gets to celebrate, Irish or not! Leprechauns, rainbows, and pots of gold spark the imagination of little ones, making for some enchanting crafting opportunities. Check out some of our favorite St. Patrick’s Day crafts and have fun creating memories with your favorite little hands! Three or four little handprints in green paint can make a perfect Shamrock craft! Add a simple message to the page and don’t forget to add the year. 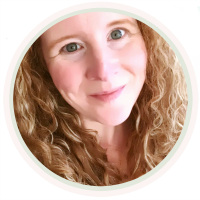 Kids can write (or dictate to you) their favorite green things, what they love about St. Patrick’s Day, or a wish for the coming year. This is a sweet memento to add to a memory box, pulling it out later on and remembering those tiny hands. Make a rainbow cloud craft to celebrate St. Patrick’s Day. 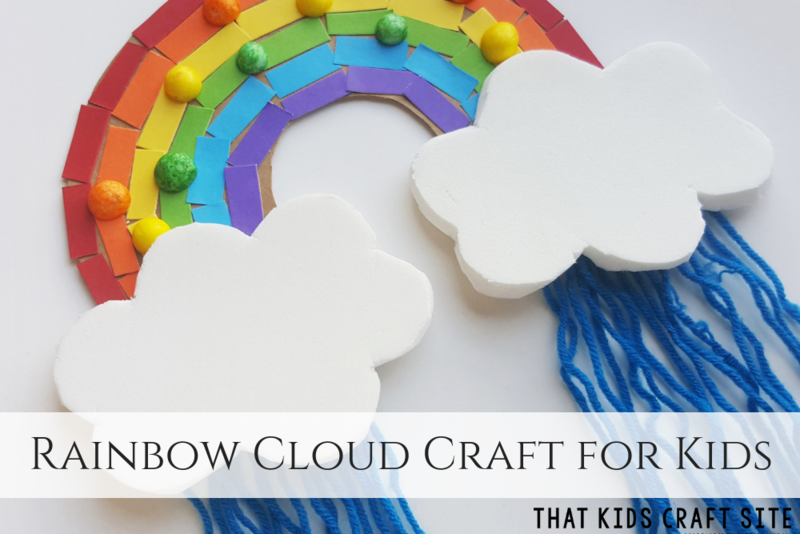 This fun rainbow craft makes a great ceiling decoration and is the perfect way to brighten up a dreary March day! Glue together several craft sticks to make a rectangle shape that is slightly narrower than the length of one craft stick. Attach two craft sticks across the bottom to make the brim of the hat. Paint your leprechaun hat green and don’t forget to add the band and buckle! This makes an adorable door or wall hanging to decorate for the holiday! 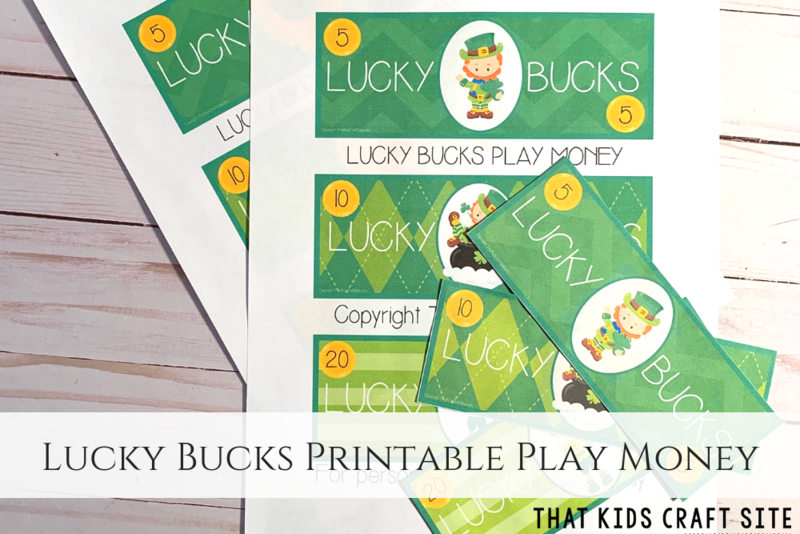 Print out some pretend play money and create your own leprechaun-inspired economy! 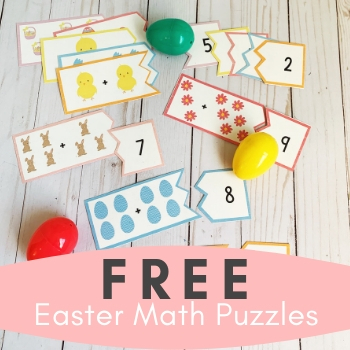 This printable play money can be used for activities, to “pay” for crafts from your friends, or as a reward for completing tasks or chores. The possibilities are endless! A green bell pepper makes a perfect shamrock stamp! Just cut off the top or bottom, clean out the seeds, then dip into green paint. 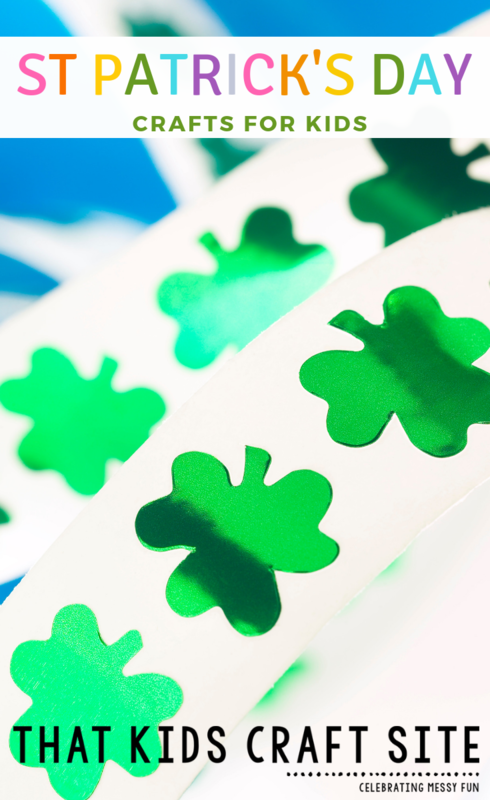 Little ones can stamp in a pattern, make a card, or create a fun decoration for Saint Patrick’s Day! 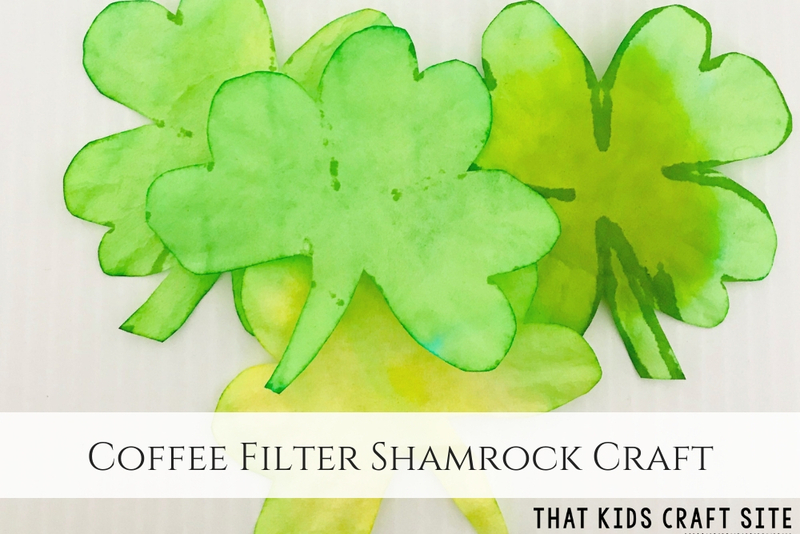 Make your own St. Patrick’s Day garland with these super easy and super cute coffee filter shamrocks! All you need are some coffee filters, food coloring, water, and scissors and you too can make your own shamrocks! Not real confident about being able to cut them out? Don’t worry! There’s a free printable shamrock template included too! Cut out the shape of a pot of gold from black construction paper. Help little ones cut out coins from yellow paper and write on them things that they are thankful for. They can add their treasures to the pot and be reminded of all the things that are “golden” in their lives. Draw or paint a rainbow on a sheet of construction paper. Cut out a “pot of gold” from black paper, gluing it to the end of the rainbow. Attach pennies to the top of the pot. Display for all to see. Who knows? Maybe a leprechaun will show up! 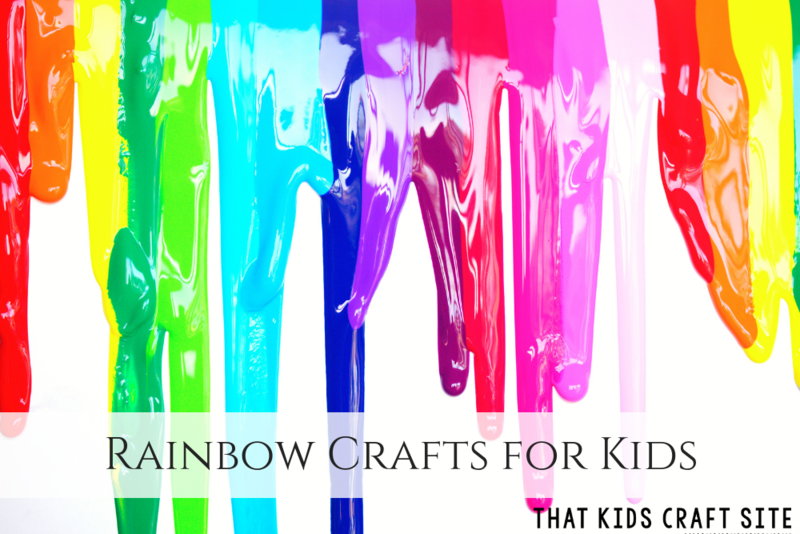 Check out these colorful rainbow crafts for kids that are perfect for St. Patrick’s Day crafts! There’s something for kids of all ages! Cut a sponge into a shamrock shape, dampen it, and help little ones spread chia seeds all over the top. Spritz with water regularly and put in a sunny window. Before long, your shamrock will begin to sprout! Don’t have chia seeds? No worries! Grass seeds work great too! Cut out a leprechaun hat from construction paper and glue to a paper plate. Cut thin strips of orange construction paper and wrap them around a pencil or crayon to curl. Glue the orange strips to the bottom of the plate to make a beard. You can decorate the center of the plate with a face or cut out the middle before you start and make it a mask! Paint and decorate a shoe box, cereal box, or other container and use it to try to catch a leprechaun. Don’t forget to bait your trap with a shiny coin and then hope the leprechaun takes the bait. We haven’t successfully caught one yet, but we know we’ve come close because of the gold glitter that he left behind! 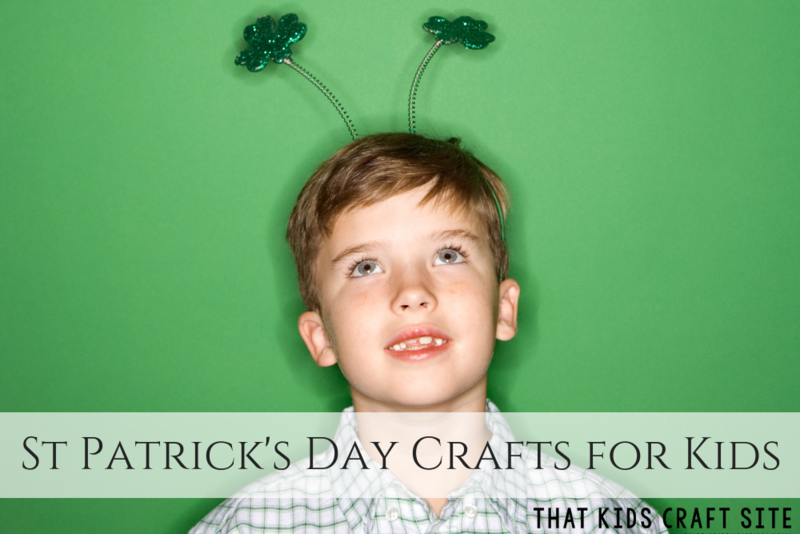 Have a blast making your St Patrick’s Day crafts! 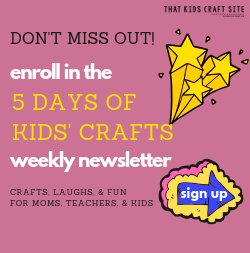 If you make one be sure to tag us on Instagram @ThatKidsCraftSite! We’d love to see your creations!